I was totally on the fence too- the guys are so different but yummy in their own ways. I absolutely adored this book. I am more team Ren though, there was just something about Shay that put me off. Wow, I need to add this to the TBR right away. I love reading books that have love triangles (hopeless romantic, right here!) and your review just made me want to read it that much more! gosh, i really need to read this book soon! thanks for the great review! Love your blog, I just started my own..."grandma reads ya", with a YA author in the family. 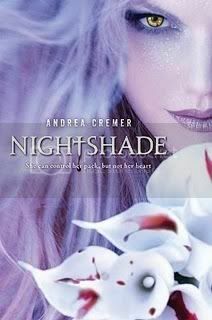 I just started "Nightshade" and am looking forward to finishing it after reading your review.